Written fiction is comparatively unique among art forms. Why? Because it isn’t visual. Unlike theater, dance, painting, sculpture, and photography, writing offers no inherent visual images. And yet, as any reader can tell you, reading a good story is a tremendously visual experience. This means you, as the writer, bear an important responsibility to make your writing more visual. Think about your favorite book from childhood. You see it, don’t you? Think about the novel you’re currently reading. The first thing that pops to mind is probably an image you’ve imagined based on the author’s words. That’s the phenomenal power of wordcraft. Unlike other art forms, writing has you creating something out of nothing. You are triggering the magic of your readers’ imaginations to help them, in essence, create their own art. Unlike viewing a painting, in which everyone sees pretty much exactly what the artist put on the canvas, reading written fiction allows the individual participants to paint their own mental pictures—with just a little help from the author. That’s where you come in. 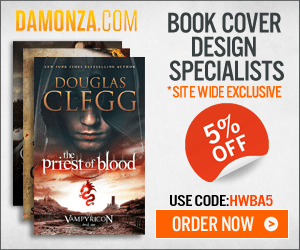 It may sound as if readers are doing half or more the work, and authors therefore have it totally easy in comparison to their visual-artist brethren and sistren—but not so. If anything, your job is all the trickier for the subtlety involved in creating stunning visuals out of literally nothing. Sounds like a blast, right? Today, let’s talk about how to make your writing more visual, and, in so doing, improve just about everything about your story. Let’s be honest. When it comes to visuals, all written fiction looks exactly the same. Little black squiggles on a white page. Visually, it’s about as exciting as the lines in the concrete sidewalk outside your house. But when authors do their jobs right, few readers remain aware of the black-and-white reality in front of them. Visual fiction is designed to help the readers visualize the story. There’s a very good reason most of us fall asleep over dry textbooks. There’s nothing to visualize. Less than a month after the Battle of Lexington and Concord, on May 10, 1775, the Second Continental Congress convened in Philadelphia. John Hancock was elected president. The assembled representatives of the American people decided emphatically that they would fight. The Continental Army was established, a call was issued to the colonies to raise troops and funds, and George Washington, who had distinguished himself as a lieutenant colonel in the French and Indian War, was appointed commander-in-chief. Not exactly this, it it? Or how about this, from J.M. Hochstetler’s Crucible of War? Squinting through the Stygian gloom against a driving sleet that threatened to scour the skin from his face, Carleton assessed the faintly blacker line of the frozen New Jersey shore still some distance ahead. Their progress was agonizingly slow, and at every moment the water’s surge drove jagged ice floes against their clumsy vessel, threatening to either stave it in or capsize it. Or both. The rising nor’easter that had plagued the Continental Army all the way to McKonkey’s Ferry, increasing in intensity while they embarked on a fleet of heavy black Durham boats, ferries, and other sturdy craft, showed no signs of diminishing and every sign of worsening. Its shriek whipped away the creak of oars, the slap of water and the thud of ice, the stamp of horses’ hooves against the ferry planks, and the animals’ occasional agitated squeals when their footing lurched beneath them. Visual fiction uses a deft weave of narrative techniques to create vivid moving images in the readers’ minds. It turns words on paper into mental movies. In order to make your writing more visual, it must offer two things. This is in contrast to the dry recitation of fact in the textbook excerpt above. The only image it offers is that of George Washington—and only because most everyone already has his face imprinted in their memories. This in contrast to abstractions, which offer the idea of an image, without providing enough information for readers to actually create their own mental vision. Abstractions are generalities. They’re also things we take completely for granted, which means you may sometimes not even notice you’re using them. Abstractions can show up at any level within the story, in plot, theme, and character. At best, they use a foundation of shared understanding to build common ground with the reader. At worst, they end up as shallow stereotypes, symptomatic of authors unwilling to dig deeper for the unique and vibrant specificities of their own stories. If you can learn to replace abstractions in your descriptions and the narrative itself, the bigger-picture generalities will often fall away effortlessly. Like dreams, fiction communicates in images. Why? To involve you in the story, to engage your narrative imagination. To affect your emotions. Images are more vivid and more emotionally powerful than abstractions. In writing, both are formed with words. Figuring out how to make your writing more visual is as simple as following these three steps. Before you can make your writing more visual for your readers, you must first be able to visualize it for yourself. Most stories come to their authors in visual snippets, so you doubtless already have some ideas. Here’s how you can dig even deeper. In his book From Where You Dream, Robert Olen Butler calls the writer’s immersion in the subconscious imagination “dreamzoning.” He encourages writers to deliberately set aside time to focus on this. Sit in a dark room or go outside at night. Light candles or a fire pit. Turn on some powerful music. Just sit there for an hour or two and let your mind wander over your story. Don’t get too conscious in planning your plot or figuring our your characters. Just let the images float through your mind, like the snippets of scenes in a movie trailer. 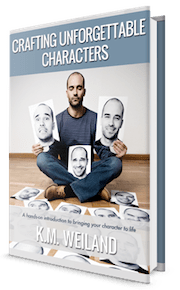 Not only will you gain some great visuals, you’ll also come up with organic and powerful scenes, and learn things you never knew about your characters and themes. Use the Internet to your advantage. Just as interior designers create a “mood board” to help them find the right feel for the rooms they’re decorating, you should collect images that help you turn your own imaginings into concrete realities. Look for characters, settings, clothing, props. I collate Pinterest boards for all my books, including my portal fantasy sequel work-in-progress Dreambreaker. Even if you feel you have a very clear mental image already in mind, finding a specific representation in an actual photo or painting can help you flesh out the vague and foggy corners. Push yourself. Especially when the time comes to actually sit down and start outlining or writing, get into the habit of taking a second or third look at everything in your story. Instead of a standard castle with moat and turret, what could you create that would add more visual originality? Instead of giving your heroine a simple locket as a keepsake, what could you come up with that would be more visually interesting and, even better, more characterizing? Make sure you’re taking full advantage of every character, setting, and prop in your story—no matter how inconsequential. Remember, you’re not writing a book, you’re creating a mental movie. So let it play in your head. How would you shoot it if you were a director? What would the cinematography look like? What would the soundtrack sound like? Sink into your dreamzone and watch your story unfold in front of you. Does it look suspiciously like the last twenty movies you saw in the theater? Then you know you have to go deeper still to find the truly unique and interesting images readers haven’t already seen a hundred times. Imagery is powerful because it is visceral: it plunges your readers into places, situations, and relationships they would never have otherwise experienced. But it’s arguably even more powerful because it is inherently subliminal. Images speak to the human consciousness on a deeper level. The sea, the moon, the twilight—all of these speak of more than just the surface objects, colors, and meanings. They are general symbols, which we all understand. But they can also be specific symbols that speak to the specific thematic motifs within your story. 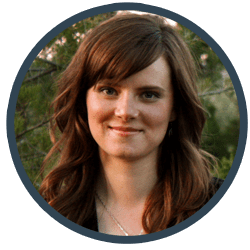 Every single image in your story offers the opportunity to enhance your story’s deeper meanings—but only if you consciously examine each scene for specific images that quietly underline your theme and advance your plot. As you’re digging past the obvious images to find those unique to your story, make sure you’re not just choosing those that are flashy. Refine your choices by selecting settings and props that have special meaning (or will come to have special meaning) for your characters and their inner journeys. Symbolism speaks largely to your character’s inner conflict and character arc. But you’ll also want to choose images that serve double duty by explicitly advancing your plot. Try to avoid imagery (or settings or characters or props) just for the sake of imagery. Every time you add a new element to a scene, ask yourself, “How can this tie into and advance the story’s external conflict?” If it can’t, then choose something else. Symbolism is a powerful tool of subtext. Because it is both blatant and subliminal, it works to create a layer of deeper meaning without being on the nose or preachy. Nowhere does written fiction have a greater opportunity for subtlety than in its imagery. When you choose a powerful image that speaks to your story’s theme, you are showing readers, without needing to resort to any type of telling to get across your message. Even better, creating beautiful images on the page gives you a ripe opportunity for adding a little poetry to your prose narrative. As you can see from the beautiful examples in the previous section’s graphic, gorgeous imagery is almost always the result of gorgeous writing. Now that you’ve learned how to discover and refine the right choice of imagery for your story, you get to start bringing those images to life. It’s not enough to simply tell readers “a boat moved through the river,” you must bring the moment to life in a way that makes them feel the bump of the waves, the spray of the water, and the hot reflection of the sun. Showing gives readers the details they need to bring the scene to life in their own imaginations. It provides them the tools to become, essentially, your co-writer. Choose your words carefully—they are your only weapon. Look for specific and vibrant choices. Don’t write “off-white,” but “bone-white,” “moon-white,” or “white the shade of week-old snow.” One well-chosen detail can bring to life an entire scene. Exercise your right to colors. A single splash of color can transform a description. Which do you see more clearly? In order to fully represent a setting or cycle of motions within your story, you need to fully understand the physicality of your story. Don’t know what the distance of 100 yards looks like? Go outside and pace it off. Don’t know how a fistfight would play out in real time? Block it out with a friend or at least in front of the mirror. Don’t know how a jackhammer would feel in your hands? Go borrow one. Finally, a word of caution. As I’ve written about elsewhere, learning the perfect balance of description in your narrative is really the art of good narrative all to itself. Ironically, striving to make your writing more visual does not mean sharing every last possible visual detail with readers. Thomas Hardy may have been able to get away with writing an entire first chapter’s worth of description for his main setting of Egdon Heath in Return of the Native, but you don’t need to do that. You can achieve exactly the same effect in a careful paragraph (or less) of well-chosen descriptive words. There are only a handful of things that raise a novel out of the pile of mediocrity and into something truly memorable for your readers. Strong visual writing is one of those things. If you can convince readers to imagine your story as vividly as you imagine it yourself, you will have succeeded in your first, and arguably most important, task as a writer: that of bringing your story to life. Wordplayers, tell me your opinion! What are you doing these days to make your writing more visual? Tell me in the comments! I fail miserably at descriptive writing. It doesn’t come naturally to me. I’m forward marching with my first draft knowing that during revisions, this is one of the points I will need to work on. Would this be the way to do it? Or do I need to consciously try during my first draft? Which by the way sounds extremely painful to me. I’m not a descriptive writer at all and I know this is a weak point which I need to explore. There’s a time and a place for both approaches. I generally find I do my best work in the first draft, so I do like to try to get it as close to right as I can. However, I’ve also learned I don’t want to get so caught up in the little details of perfection during the first draft that I kill my forward my momentum. So I find a happy medium by both trying to write as quickly as possible, but also as completely as possible. I like you try and do the same thing, but after reading your article can now see why I have received negative feedback on my latest manuscript. I will now re write the various sections to make them more interesting. Many thanks for your advice which is much appreciated. I like your tip of acting out or directly experiencing our stories’ required sensations. That’s something I’ve only started doing more recently, and it’s made a world of difference. It’s one thing to know what a hunting knife looks like. It’s an entirely different thing to feel its heft in your hand. That’s the irony of great “visual” writing. While we call vivid descriptions cinematic, fiction actually creates a more immersive experience than even the best films. True, it’s hard to achieve those sweeping landscapes on the page, but fiction allows us to feel the bite of winter air in our air passages or smell the gunpowder wafting on the breeze. Great visual fiction uses many senses, and, to me at least, is more akin to stepping into another person’s skin than watching them on screen. This reminds me of why I read not just the wonderful articles here, but also the insightful comments. Thinking about immersive experiences — really feeling what it would be like to be a character — I suddenly realized that two of the characters in my romantic comedy story have very different perceptions of the sensory world, and that the details they pick up on will reveal character (and not just setting). A really important realization for me, because raw sensory data absolutely bores me, but in a good story, the sensory data ISN’T just raw sensation — it’s part of the character, and part of the MEANING. I’d venture to say the vast majority of writer-types tend to be “head” people more than “body” people. So it can be easy for us to get so stuck in our heads that we lose track of the realities we’re actually trying to convey on the page. Insightful! I hadn’t given much thought to the difference between images and abstractions along with their subsequent impact on reader’s imaginations. Very similar to something I like to say on my own site often: never be normal. Normal doesn’t stand out, doesn’t get noticed. I recall a former post of yours about using unexpected words, like calling a staircase, “splintery.” I think this a very handy practice when creating imagery: go with the unusual and irregular. When it comes to symbolism in images, I often try to use colors this way. Sixth Sense was a good example of this, where the color red was a direct indication of something important within the film, namely the presence of the departed. I think this use of color can have a powerful effect on readers, whether or not they’re directly aware of it. Truth be told, that example has stuck in my mind as a prime one for word choice, much like a splinter in one’s hand, but less painful. I remember about the splintery staircase. There must be more of us. Yeah, it’s a good bit of advice. Take a person off guard, and get them to think. But in a good way. It’s like dumping a bucket of ice cold water on the reader’s head. I like trying to find words that are off the beaten track. And you would know, I like not being ordinary. Thanks – glad to hear reinforcement at times that I am on the right track. Kind of an interesting not really visual but conveyance of an emotion – with kind of a bonus visual. There’s a lot of ways to say the same thing, but every word counts – as you often say. Sounds good! I’ll have to check it out. I think it’s called The Days of How and Why, but the whole Ashes and Ice album is really good. Actually I like almost everything by The Kills. Oooh, I love the excerpt of “Crucible” just for its use of Stygian, a word I don’t see too much of these days. I like to use the connotations of words to set moods. If darkness is being compared to the underworld, then it primes the reader to the threat of death and danger, especially preternatural danger. I’m not very visual, so I really have grabbed measuring tapes to see how far away 100 feet was. It was for a scene where I’m trying to convey that the flames were so hot in one spot that a character could feel the heat from a given distance. I try to avoid saying something “smelled of _insert exotic scent here_” because that’s more of a tell for me than a show. I’ll sometimes visit health stores just to see what certain herbs and oils smell like. So, when a character wrinkles her nose when she catches a whiff of dandelion tea, I say it’s because the scent reminds her of her baby cousin’s wet nappies. That’s how the tea smells to me. And it has a very grassy taste. Blech! For situations where I can’t get personal knowledge, I ask around. I have a character whose father was a Roman-era silversmith. Since silversmiths aren’t common now, I emailed one who has a blog (and happens to be a novelist) and asked her for sensory details of her workshop. Now I know what scents would trigger the character’s memory of her father’s shop (beeswax and pitch, if you wonder). Your contrast of Anne’s night vs. a Stygian night raises the great point that all descriptive choices are ultimately characterizing. They don’t just tell us about the object they’re describing, they also tell us lots about the person doing the describing. Excellent advice, and very much needed. Sometimes there is nothing to match real physical experience. I have a character who is a gardener, but I never kept my own plants until recently, and it makes a difference. I had long imagined having a couple of characters lost in the woods, but I understood the story much better when I actually went into the woods myself, wandered around and feared I had lost the marked trail, and had a real snake cross my path. There’s something bracing about the real wild, with its real possibility of danger (however small), that goes beyond all the beautiful symbolism of a purely imagined forest. And for my story, I want both — the heightened pulse of the real danger, and the awe of the archetypal tree. Yes, it’s amazing how you can have a really good sense of something in your head (from reading about it, watching it on TV, and imagining it), but actually experiencing takes everything to a completely new level. Thank you K.M so much especially for this post. As a painter and writer, I find this post a perfect match to describe the similarities and differences between writing vs visual arts. Keep up the great work. Love your blog and podcast! I like watching artists on YouTube, partly for research for my graphic novel. When they describe what they are doing, it’s almost like you can shut your eyes the whole time, open them at the end and compare the images. Another amazing thing about narrative is we all get a different image from the same words. If a writer were able to see all these images that their own words created, it would be an amazing thing. And probably very amusing at times. Dreamzoning? I call it daydreaming, and I do it by accident. A LOT. Probably more than I should. I just need to word my descriptions better. I have the image completely in my head, but sometimes it’s difficult to efficiently present it. But whatever, that’s what rough-drafts are for I guess. An above poster commented about not putting much detail into the first draft. I’m likely the opposite – I’ll be hacking at the word count, trying to convey the image in many less words. I can certainly babble on at times, that’s for sure. Writing what you know helps, and I like your tip of learning what you are writing about. It’s all about learning. There’s never an end, and that’s a good thing. That’s what life is all about. Thanks for the great advice in this post. Writing a good description is by far my biggest weakness as a writer so this helps. Honestly, description is tricky. It’s an art form unto itself that can be difficult to teach, since the execution varies depending on what’s being described. Everything I write, in the first draft, lack the kind of detail that help readers imagine, not only read. Every time, I force myself to put details on specific things, then when I read what I wrote the details are not so good as I thought they were. Using an outline has helped me, but I think I only have to work very hard on this stuff. I’m trying to get better. Any advice? Thanks for your posts and your work! First drafts aren’t meant to be perfect. The very fact that you’re recognizing your shortcomings and taking conscious steps to correct them is great. You might also find this post helpful: Ineffective Setting Descriptions. Thank you. I’ll try from tomorrow to use this tips. I know the first draft is’t perfect, and I’m fighting with this feeling. Maybe I’ll make a better work with time. Thank you. Great stuff. I’ve been doing better at this the further I get into my rewrite. Often I get too wordy in describing feelings and images. This is from my recently completed chapter. The first half is to give context to the symbolism in the second. Originally I just had a bunch of kids around a campfire. The symbolism of the hot dogs in the fire didn’t become apparent to me until I actually started writing the words. He switches subjects mid sentence but they’re really still talking about the same thing. Hannah took the short, glowing marijuana cigarette, holding it between the thumb and index finger of her right hand while she considered it for a second or two. Bringing it to her lips she inhaled and then quickly gagged. Hearing a round of giggles from the others, she pounded her left fist on her chest twice, nodded and said, “I’m alright” – then took a second drag that she managed to hold in a while longer before again coughing up the contents of her lungs. She turned to pass it to me but I frowned and shook my head, so instead she reached over me to hand it off to Susie – who had no difficulties inhaling, holding, then blowing out a puff of smoke. Hannah and I held our hot dogs side by side, dancing above the fire as we slowly spun the sticks, together and apart, dipping into the crackling flames and out again. As I watched how the outside casing of my hot dog blistered and cracked open in the heat, to my left Susie pulled hers back and was impatiently blowing and dabbing at it. I know it’s overwritten the moment I’ve done it and it bothers me – I can’t let it stand. I’ve ended up being dialogue heavy, both internal and external. Whatever the POV character experiences, in the moment. Yes, I’m the same way. I like to get my first draft as clean as possible. But it’s still amazing the stuff that slips by. Nothing wrong with abstractions occasionally. It’s like “telling”–we don’t want to get rid of it entirely; we just want to use it in its place. I stumbled upon your site while googling something recently. Don’t remember how I got to your site, but I’m glad I found it. I’m enjoying reading all the blogs and have even ordered a few of your books. I’ve been writing for over 20 years, and there’s always something new to learn. ‘Never stop learning,’ is what I always tell myself. Thanks for all the insight and wordiness of thought! Thank you, thank you, thank you! The part about symbolism and theme is exactly what I needed! I’ve been trying to understand how to use symbolism, but never quite knew how to start, how to come up with the images in the first place. Now I do! Thank you again! You’re welcome! I suffered the same confusion about symbolism myself before figuring out how to ground it solidly in the theme. 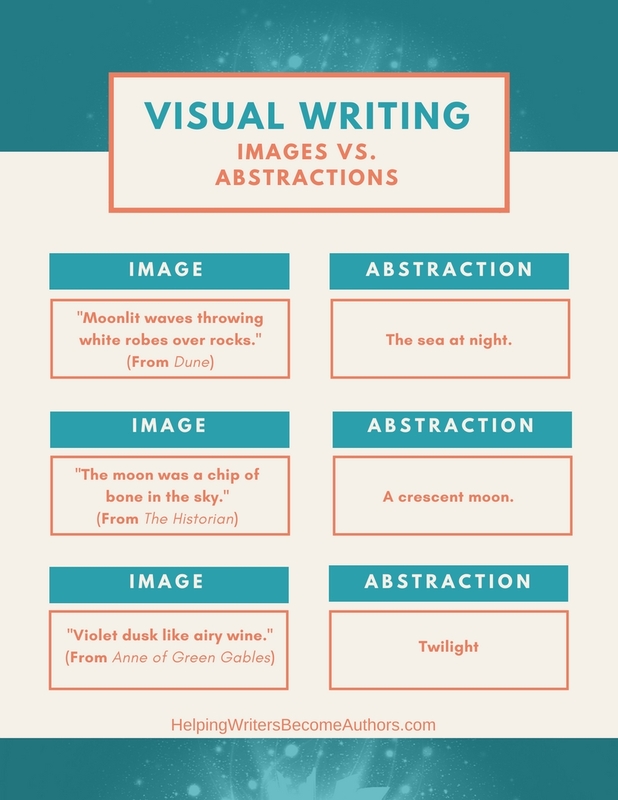 This is a great reminder for writers to incorporate visuals in their fiction. Good job Katie! I search online for images related to parts of my story. Then I collect them in a series of PowerPoint slides. I shift them around, add text notes, circle salient features. I import the slides to Notability to do some of the notes and circling. Then I try to write descriptions based on what Insee in the slides. Great tips to consider for your script, during the re-write process it was a simple solution and have tried many things.